More than 10,000 years later, bread has clearly evolved, but perhaps not as dramatically as the technology being implemented to bake it. Breadbot is an autonomous bread-making machine that prepares bread without human assistance. In the beginning, archaeologists believe, the first breads were created using some of the most rudimentary technologies in human history: Fire and stone. In the region that now encompasses Jordan, one of the world's most ancient examples - a flatbread vaguely resembling pita and made from wild cereal grains and water - was cooked in large fireplaces using flat basalt stones, according to Reuters. The taste: "Gritty and salty," Amaia Arranz-Otaegui, a University of Copenhagen postdoctoral researcher in archaeobotany, told the wire service. "But it is a bit sweet as well." The latest example of this odd pairing of old and new is the Breadbot, an autonomous bread-making machine that mixes, kneads, bakes and cools bread without human assistance. The robot bread maker - which can produce 235 loaves a day (or about 10 loaves an hour) - is on display at this year's Consumer Electronics Show in Las Vegas, where one reporter labeled it the media expo's "best-smelling booth." The Wilson Baking Co., which created the machine, says their robotic oven is not limited to white or whole wheat dough and can also produce nine-grain, honey oat and rye breads. Once a human adds dry mix is added to the hopper, the company states on its website, "the process is fully automated." Once the dough is mixed into balls, the machine moves them onto a conveyor belt, shapes them, and puts them inside individual trays where the dough is baked into bread. Once finished, a robotic arm moves the freshly-made loaf to a vending machine for customers to purchase using a touch screen. "From the water temperature and mixer speed to the proofer humidity and loaf height, sensors are always monitoring what's going on," the company states. The robot isn't fully independent, the company states, noting that users still need to clean the machine after it's used and slice the final product. 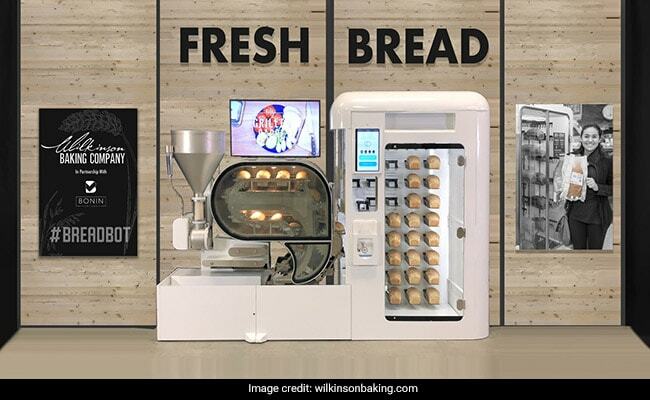 The machine is being marketed to grocery stores as a way to jump-start bread-making several hours before a store opens and allow the user to schedule baking times and loaf quantities months in advance. "Bread is a staple of American life. But in most supermarkets today, it has lost its emotional connection with the shopper," Randall Wilkinson, CEO of the Wilkinson Baking Co., said in a news release. "In the age of home delivery, the BreadBot attracts consumers back to the store because it delivers fresh, delicious bread that is produced with theater and engagement." Wilkinson told GeekWire that his company plans to put the Breadbot inside a "partner store" later this year, but declined to reveal the name of the store. He added that "three of the top five grocery store companies in the U.S." have shown interest in testing the robotic baker. 13,000 Jellyfish Stings Prompt Australian Officials To Declare "Epidemic"